The Royal Shakespeare Company has cancelled the first two screenings at its open air film festival because of the recent flooding. The films, which were to be shown at Stratford-upon-Avon's recreation ground over the weekend, have been cancelled amid fears the ground may be wet. The town centre was under several inches of flood water over the weekend after the River Avon burst its banks. Stratford will also get a share of £1m flooding aid for the West Midlands. Regional development agency Advantage West Midlands announced it was providing the money to support five areas in the region worst-hit by flooding. The others are South Shropshire, Malvern Hill, Wychavon and Bridgnorth. It is in addition to the £10m flood relief promised by the government for all areas across the country affected by flooding. The two films, Shakespeare in Love and Throne of Blood, were due to be shown on Saturday and Sunday as part of the Shakespeare on Film open air festival. Other performances should go ahead, starting with Kenneth Branagh's Love's Labour's Lost on 18 August. An RSC spokeswoman said it was disappointing. "We're hopeful by mid-August the weather will have improved and are working closely with Stratford District Council to monitor the situation," she said. 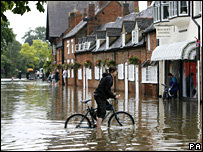 Heavy rain last Friday led to several towns across mid and South Warwickshire being affected by flooding. Leamington Spa was badly hit as were the villages of Hunningham and Eathorpe. Sixty roads in the county were closed but have since reopened. Flood warnings have now been removed from rivers in South Warwickshire. The River Stour and its tributaries remain on flood watch.